On the Oakton Patch this week, I write about why Santa hates the poor. Hope everyone has had a great holiday -- based on the fact that I have turned into a tub of goo, I'd say I've enjoyed myself a lot. All I want for Christmas is...AAAAHhhhh! Not that! I've been methodically unsubscribing myself from gazillions of e-mail lists this holiday season after receiving a mailbox-clogging amount of offers and specials from every retailer on the planet. And even though Groupon inundates me, I cannot bring myself to unsubscribe from that site, because I love a good deal. 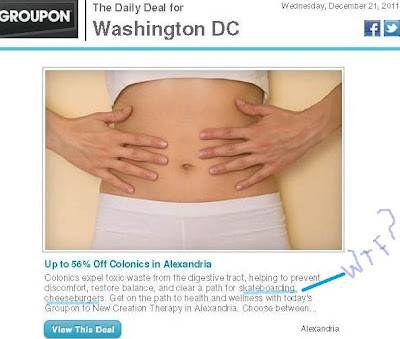 1) Colonics? Wasn't this a "thing" for about six minutes in 2001? They still do this? 3) Skateboarding Cheeseburgers? How good is the stuff they're smoking at New Creation Therapy? 4) Does everyone else agree that the folks at New Creation Therapy may be enjoying their colon-flushing job a little too much? This is text from their site: The therapeutic center recommends eating a normal meal three–four hours before the treatment and using the time in between to become fluent in a new language. 5) It is things like this that make me want to actively work on my drug addiction. TIs the Season to be a Complete Narcissist - fa la la la la la look at me! If you think this is obnoxious....please note that this is not even actual size. Forget keeping Christ in Christmas -- I'm campaigning to keep the Christmas letter in Christmas. Ahhh...the magic of the holidays. A time for dinner dates with Herman Cain, sartorial rants and plenty of elf martinis.